Our criminal defense law firm regularly defends clients in Apache Junction domestic violence cases. In Apache Junction, and the surrounding areas of Pinal County, when family, romantic partners, or roommates phone 911, the Pinal County Sherriff’s Office or Apache Junction Police Department sends police officers. Once police arrive, they look for physical evidence of domestic violence crimes, separate the parties, and take statements. The statements may be recorded by either body worn cameras or recorders. They may also take hand-written statements. Recordings and written statements are submitted to the evidence department. The responding officers rarely see the domestic violence unfold, and instead, rely on the statements of witnesses; as such, police sometimes charge the wrong person or make an arrest when no crime was committed. When Apache Junction law enforcement makes a domestic violence arrest or submits domestic violence charges, the Apache Junction City Prosecutor or Pinal County Attorney’s Office handles the case until resolution; prosecutors go forward even when it’s not what the victim wants. Ultimately, it’s the government pressing charges, not the victim. While they might consider victim input, the prosecutor has the final say. Tobin Law Office Provides Clients with Dedicated and Experienced Defense Services in Domestic Violence Matters in Apache Junction and the Surrounding Areas of Pinal County. Arizona’s domestic violence laws are complex, multi-faced, and harsh. For these reasons, it’s important to discuss your case with an Apache Junction criminal defense attorney to protect your future, liberty, and rights. Criminal lawyer Tim Tobin is a former prosecutor with many years of experience in defending clients against domestic violence charges. Courts Handling Domestic Violence Cases in Apache Junction and the Surrounding Areas. Domestic violence cases that occur within Apache Junction’s city limits are investigated by the Apache Junction Police Department. The Apache Junction police department files misdemeanors in the Apache Junction Municipal Court. If an alleged misdemeanor incident took place in one of the surrounding areas, such as San Tan Valley, Gold Canyon, or Youngberg, the case is usually filed in the Apache Junction Justice Court. If the case is serious enough, or the accused has a sufficient criminal history, police will refer the case to the Pinal County Attorney’s Office for felony charges in Pinal County Superior Court. What is a domestic violence offense? Domestic violence is an added allegation to a criminal charge exposing a defendant to harsher, and sometimes mandatory, penalties. The domestic violence allegation states that a defendant is domestically related to the victim. Arizona’s definition of domestic relations includes roommates, spouses, romantic partners, relatives, in-laws, and roommates. The relationship can be past or present. Thus, any household, family, or romantic relationship will likely result in a domestic violence allegation. With the domestic violence allegation comes harsher, and sometimes mandatory, penalties; these can include an intensive domestic violence program, loss of the right to bear arms, and child custody consequences. In addition, a record of domestic violence can be seen by companies, organizations, and individuals who perform background checks. Domestic violence allegations can also potentially elevate a misdemeanor to a felony. Contact Us Anytime for a Free Consultation. What Arizona crimes can be charged with domestic violence language? A list of the crimes that be charged as a domestic violence offense are found in Arizona’s domestic violence statute. It’s a lengthy list, but the more common ones are as follows: threatening or intimidating, ARS 13-1202; assault, ARS 13-1203; aggravated domestic violence, ARS 13-3601.02; aggravated assault, ARS 13-1204; unlawful imprisonment, ARS 13-1303; criminal trespass; criminal damage, ARS 13-1602; interfering with judicial proceedings, ARS 13-2810; disorderly conduct, ARS 13-2904; and preventing use of telephone in emergency, ARS 13-2915. Consequences, Penalties, and Implications for Domestic Violence Charges in Apache Junction and the Surrounding Areas of Pinal County. Domestic Violence charges, in Apache Junction, Arizona, can carry severe and lasting consequences. A major concern is that it leaves a permanent violent criminal record that cannot be expunged from public records. In addition, a domestic violence conviction impacts firearm rights, child custody cases, employment, and more. That’s why anyone charged with domestic violence in Apache Junction should consult an Apache Junction criminal lawyer who’s familiar with Apache Junction’s criminal courts and the agencies that process Apache Junction cases. Apache Junction domestic violence penalties will vary depending on the alleged criminal conduct and the defendant’s criminal history. The first step in understanding potential penalties is to determine whether the case is filed in felony or misdemeanor court. The justice courts, city courts, and municipal courts only handle misdemeanors. Conversely, domestic violence cases in the Superior Court have at least one felony charge. Below, we’ll respectively go over the potential penalties for misdemeanors versus felonies. We’ll then discuss the collateral consequences of any domestic violence conviction. Maximum misdemeanor penalties in domestic violence cases. Maximum domestic violence penalties hinge on the classification of each misdemeanor charged. Class 1 misdemeanors carry up to 180 days jail, $4,575.00 in fines and surcharges, and three years probation. Class 2 misdemeanors carry up to 120 days jail, $1,372.50 in fines and surcharges, and two years probation. Class 3 misdemeanors carry up to 30 days jail, $915.00 in fines and surcharges, and one year probation. Misdemeanor probation can be ordered as summary, unsupervised, monitored, or supervised; moreover, a judge can order a variety of specific probation conditions. Jail time is served at the Pinal County Jail. The judge may allow weekend sentences or work release. Mandatory Domestic Violence Treatment Under A.R.S. 13-3601.01. Defendants convicted of misdemeanor domestic violence must complete domestic violence offender treatment, which takes at least twenty-six weeks, and as much as fifty-two weeks. The defendant is responsible for paying program costs. Failure to complete domestic violence treatment results in a probation violation, which allows a Judge to resentence the defendant to harsher penalties. Felony penalties in Apache Junction Domestic Violence Cases. The range of penalties for felony and aggravated domestic violence charges depend on the specific felony classification and a defendant’s criminal history. A felony conviction will result in anywhere from probation to prison in the Arizona Department of Corrections. A defendant who’s specifically charged with aggravated domestic violence, due to prior domestic violation convictions, under ARS 13-3601.02, faces a minimum of 120 days in jail. Aggravated Domestic Violence Penalties Under A.R.S. 13-3601.02. Prosecutors charge aggravated domestic violence when a defendant has two domestic violence convictions within the last eighty-four months. Aggravated domestic violence carries a minimum of four months in jail. Even worse, if the defendant has three prior domestic violence convictions, that mandatory minimum jumps to eight months in jail. Those are just the minimum penalties. As a class 5 felony, anyone convicted of aggravated domestic violence can receive 2.5 years in prison. And if the defendant has prior felonies, the prosecutor can seek 7.5 years in prison. My results turned out better than expected! Mr. Tobin's communication is amazingly fast! Collateral Consequences to any Domestic Violence Conviction. Permanent criminal record: A violent crime shows up in background checks done by employers and institutions. Gun Rights: Federal law dictates that anyone with a domestic violence conviction cannot own or possess firearms. Divorce and custody proceedings: A domestic violence conviction may raise a rebuttable presumption against custody. Employment: Many employers are hesitant to consider or hire someone with a violent criminal conviction. If use of a firearm is required at work, it can lead to suspension or termination. Immigration: Violent crimes are detrimental to one’s legal status. Diversion or Deferred Judgment Avoids a Domestic Violence Conviction. Sometimes diversion or a deferred judgment can be negotiated between the defense attorney and prosecutor in domestic violence cases. Prosecutors at the Apache Junction Justice Court will sometimes negotiate a resolution for domestic violence diversion through their provider—Corrective Solutions. Corrective Solutions provides pre-adjudication Rule 38 diversion, whereby, cases are suspended to allow defendants to complete domestic violence diversion. The program typically involves individual counseling, education classes, group counseling and community service. The cost of the program ranges anywhere from $395 to $885. Program fees don’t include victim restitution, and thus, a defendant can still be responsible for the financial harm caused to the alleged victim. The program takes 6 to 12 months. If accepted, you must contact Corrective Solutions upon receipt of a program letter. You must also write an admission to the charges, which could be used against you if you fail to complete diversion. Diversion is not allowed for anyone with a felony record, or anyone accused of committing a felony involving the discharge, use, or threatening exhibition of a deadly weapon or dangerous instrument. In the Apache Junction Municipal Court, your criminal lawyer could negotiate for a deferred prosecution program under A.R.S. 9-500.22. With a deferred judgment, the Apache Junction Municipal Court judge accepts a guilty plea, but doesn’t enter a conviction. Instead, the judge puts the case on hold and tells the defendant to begin a diversion program. So long as the program is successfully completed, the charges are dropped and the guilty plea is set aside. Diversion and deferred judgment programs are always in the sole discretion of the prosecutor. Your criminal defense lawyer, however, might explain to the assigned prosecutor why you’re a good fit for diversion. Both legal and personal circumstances should be considered when advocating for diversionary opportunities. Domestic violence diversion is usually a favorable outcome because it avoids the criminal conviction and collateral consequences that come with a domestic violence conviction. That said, if the State cannot prove domestic violence charges at trial, a defendant may be wiser to reject diversion opportunities, and instead, proceed with trial. A knowledgeable Apache Junction criminal defense attorney can evaluate your options and provide you with clear advice. The Initial Appearance Judge in Apache Junction Might Order Release Conditions that Don’t Allow you to Contact the Victim or Return Home. Often times the initial appearance judge will order that domestic violence defendants cannot return home or have contact with the victim. With cases taking several months to resolve, this obviously causes extreme inconvenience, family disruption, and financial strains. In some cases, an Apache Junction defense lawyer can file a custom written motion to modify your release conditions to allow victim contact or to return home. In such a motion, the judge will consider the victim input, case facts, and prosecutor’s position. Modification are commonly granted when the allegation is relatively minor and there’s no history of violence. Apache Junction Defense Attorney Tim Tobin Often Helps Clients Restore Their Gun Rights. Even for those already convicted of a domestic violence offense, an Apache Junction criminal lawyer can file a motion to set aside to remove your violent convict status. The legal basis for a motion to set aside an Arizona criminal conviction is found in ARS 13-907. A set aside motion cannot be filed until all probation and sentencing terms are fulfilled. Once a domestic violence conviction is set aside, a defendant can resume the right to bear arms. Tobin Law Office Provides These Benefits in Domestic Violence Cases in Apache Junction and the Surrounding Areas. Upfront and Flat Fees with Affordable Payments: Defense attorney Timothy Tobin offers excellent and dedicated defense services at a flat rate with no surprises or hidden costs. In addition, clients are offered reasonable payment schedules. Former Deputy Prosecutor: Criminal attorney, Tim Tobin, is a former prosecutor of two prosecuting offices; this provides insight on how a domestic violence prosecutor approaches the case. Excellent Communication and Personalized Service: Mr. Tobin handles all aspects of the client’s case. And all clients have Mr. Tobin’s direct line for contact by phone, email, and text. Domestic Violence Consultations are Free and Confidential: Reach out to us and you’ll be put in direct contact with Mr. Tobin to discuss your case and have questions answered. Tobin Law Office Provides the Following Services, and Much More, in Apache Junction Domestic Violence Cases. Appear in court on your behalf so you don’t miss work or scheduled plans. Arrange for telephone court appearances. File a custom motion to modify your release conditions. Help you return home or resume contact with your family. Raise and argue domestic violence defenses. Negotiate for dismissal, deferred judgment, diversion, mitigation, or reduction. Interview witnesses or conduct court-ordered depositions. Obtain evidence and discovery: police reports, video, audio, pictures. 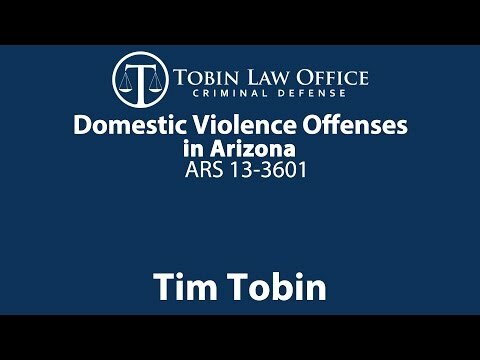 Contact Tobin Law Office for a Free Consultation on your Apache Junction Domestic Violence Case.